A sequin skirt never goes out of style, and it’s definitely a closet must-have. Maybe in a more demure black if gold is a little too brave for your liking for your cute Christmas outfit ideas this year. You can mix it up with a number of different closet pieces, for a number of different looks and events too. We love this festively-themed outfit of the day, complete with tartan / plaid shirt, and those stunning red shoes too. Tailored pieces are very much in-style right now, and tailored shirts are definitely in. We love this bright pop of colour, a great way to wear a bright shade without it taking over your look entirely. It’s a classic for the cute Christmas outfit ideas. We also love this great-shaped A-line skirt, very flattering for all manner of body types, and easy to throw on with a shirt, a sequinned top, and even a Christmas sweater. Versatile too, you could also team this look with pretty sandals for a night out, warm winter ankle boots for a more daytime look, or those Valentino beauties, as shown by this fashion icon. Layering is always a good idea when the cold weather starts to draw in. 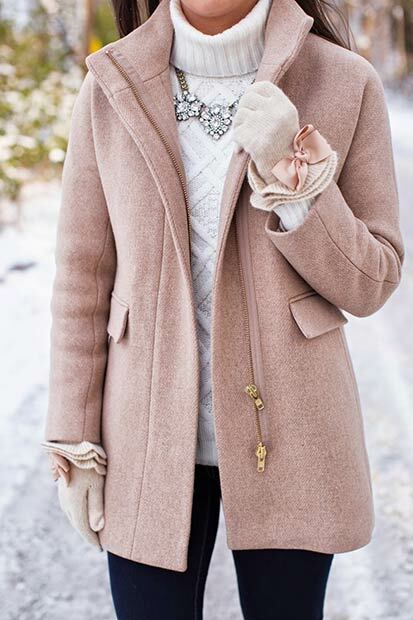 This look gives you a classic, simple, and sophisticated to rock warmth with style, all at the same time. Match your gloves to your look, and throw that bit statement necklace on over the top of your high-necked sweater, and what do you have? 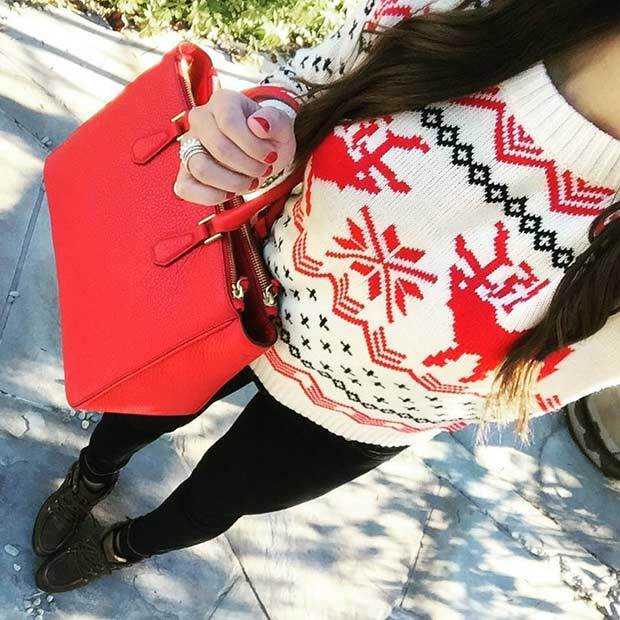 A wintery look that you could totally wear on Christmas day! Do you remember we suggested that tartan / plaid skirt in the first outfit we presented to you? Well, we’re bringing it back around again, giving you a way to mix and match those closet staples to get more than one outfit out of them. In this case, we’re teaming it up with a beautiful summer skirt, something you probably wouldn’t have thought about during the cold winter months. If this looks a little too chilly for your liking, strap the barely-there shoes with tights and ankle boots instead. You could even go for knee-high boots, totally making use of those ones you’ve been hoarding in the back of your closet for a while. When the weather gets cold, there are only two colours on our mind – hit and red. Well, that’s a little bit of a lie, we’re rocking most of the shades of the rainbow right now, but white and red is such a classic winter combo. We felt it needed its own little slice of limelight for our cute Christmas outfit ideas. Why not? If the dress isn’t quite your scene, you could replace them with red trousers and a fitted white shirt, or off-white if you’re not really a white person either. You could throw a thick white winter sweater on with your red pants, totally making use of the red jeans you bought in the summer. 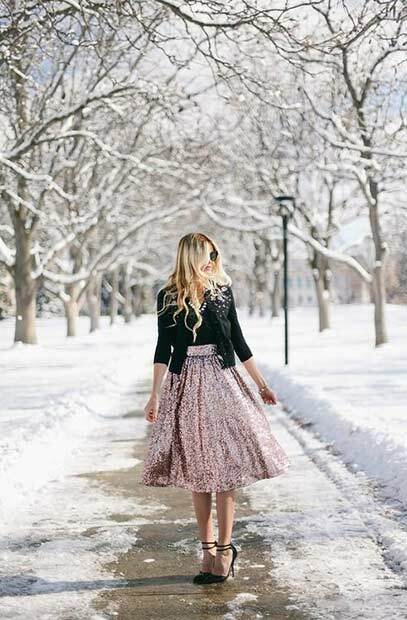 We told you that the sequin skirt would be a really bit deal for this season, and when we’re talking about cute Christmas outfit ideas, we can’t come back to it enough. There’s something truly fairytale-beauty-like about this pink and sparkly wonder, also rocking another very big trend for right now – rose gold. It doesn’t really matter what colour your sequin skirt is, or what style for that matter, we’d like to bet money in the fact that it will go perfectly with any number of black tops you own in your wardrobe. When you throw a blazer over it, with a neckline-skimming necklace if you’re feeling particularly blingy, you’ll have an outfit for Christmas that anyone would be proud of. Try it – you’ll see. 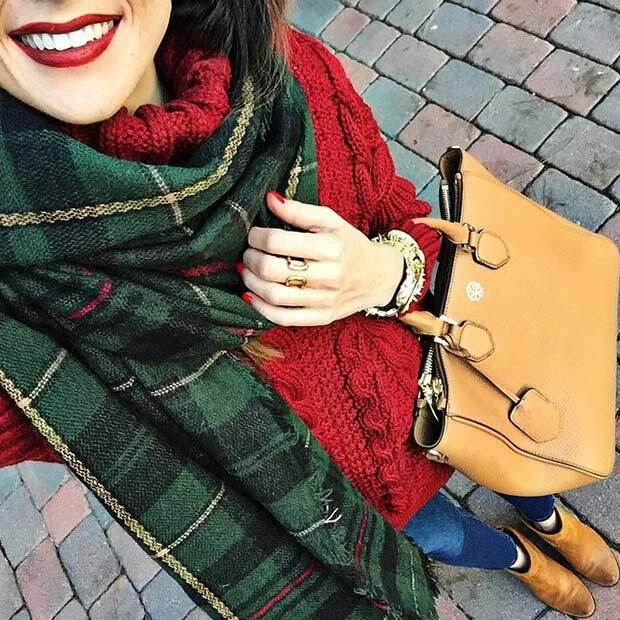 Tartan and plaid prints come back in fashion every time the weather gets a little chilly, so it comes as no great surprise that the tartan scarf and red sweater combo would be a big one this year. This is especially the case when you consider that we’ve already discussed the big red trend too. Although you might not immediately think of adding mustard-yellow accessories to this colourful, festively-themed look, it’s a great combo, especially when you add a similarly coloured pair of boots to the mix. And if you don’t have boots, opt for little ballerina shoes and socks … Because you don’t want your toes to get cold! Christmas is the perfect occasion to rock out your very best skirts, and when your skirts are as beautiful as this gold midi skirt, you should be looking for any excuse to wear them. Once again, it’s the classic additions that make the look as beautiful as it is – that simple black top, for example, and contrasting (and simple) black shoes. The big necklace works brilliantly with the high neckline, and you could also sub that black, long-sleeved shirt with a thicker knitted sweater when it gets really chilly. Remember the black blazer that we discussed earlier on too? You could totally throw that on. All of the looks that you’ll see here are really very versatile. Don’t you love it when that happens? There’s something about wearing a man’s clothes that instantly makes you feel super sassy, don’t you think? Don’t worry, we’re not saying that you should rock his suit to that big event tonight, but if it fits, and it looks great, why not? Tailored clothing is very much a big deal right now, especially with brands such as Victoria Beckham keeping the sharp, tailored looks on the catwalk. It serves two purposes – it keeps you super warm, especially with luxurious velvet materials. Love this article! 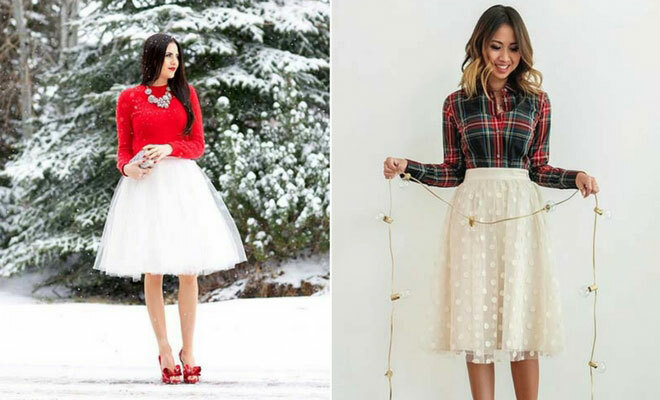 These are awesome Christmas outfit ideas. Thanks a lot for sharing. Great ideas! Loved them all except for the dark flannel shirt with the white chiffon skirt. That just looks so wrong. Everything looks so festive. It’s nice to see that instead of all the black people have been wearing for so long.